So in an earlier post I let you guys know what my specs were and I let you know that I was going to be trying out the beta on those specific specs. They are a little lower than what the minimum specs are and I totally get that. It’s starting to become an older PC and I know that I need to get a new build going soon, which is what I plan to do coming this Black Friday / Cyber Monday. So there are two playable maps for the weekend. One based on Sullust and the other based on Hoth. In Sullust you claim pods that come from the sky before the enemy team does. You activate and then defend the pod for a specific amount of time. The team with the most pods fully activated within the time limit wins. On Hoth there is a game mode called Walker Assault. The Imperials need to defend their AT-ATs to destroy the Rebel base while the Rebels try to activate these satellites to get Y-Wings in the battle to help destroy the AT-ATs. It’s like my hardware needed to pre-load the maps before I was able to play with smooth frame rate. I’d literally get maybe 1-2 frames per second for about the first 40 secs of a match and then once I was walking around the area, loading different parts of the map, I eventually was good to go. Was literally able to get about 40 frames per second on medium settings and 30 frames per second on high settings. No lag, no problems. I found this pretty cool because that means that the game is very well optimized for PC. Once my PC was able to load everything on a map it then was able to handle everything that was going on just fine. But this still sort of bothers me in a way. I want to be able to get the game to load and run smoothly right from the get go. I don’t want to have to walk around a map to get it to load more just so that my PC knows what is going on in order to play. I’ll definitely be having a different PC build, one that most likely has a GTX 970 or something equivalent, before I decide to purchase the full game. Which is still a decision that I’m not 100% sure of. The game was an alright experience. If you’re a die hard fan of the Star Wars lore then you would probably thoroughly enjoy the atmosphere that this new Battlefront game provides. However, if you are looking for a sequel of the original Battlefront games which would play similarly to them, then you’re not going to really enjoy it. I think that the full version will be MUCH better than this beta (or at least I sure hope so) because I’m pretty sure that the customization options are going to be unique, it’s going to bring a sense to the game that definitely needs to be there. It’ll make it more fun. Many people think that this is some Battlefield remake with a Star Wars skin but in my honest opinion, it’s not. It’s more so a game that has a focus on Star Wars lore rather than any other game. It’s a different kind of FPS game. It’s not Battlefield, but it’s also not Battlefront. Personally, I would have loved to see this be a direct sequel, or even a remake, of the classic Battlefront games because those games are pure gold. They are extremely fun, they have mod support and they also did great with keeping the star wars atmosphere. This new Battlefront definitely keeps the Star Wars atmosphere alive and well, but it doesn’t really play like the old games. Vehicles are power up pick ups. Many more damaging weapons, like rocket launchers, are power up pick ups. Heroes don’t last long at all. You get an exciting feeling of becoming Darth Vader and then you die shortly after, no health regen after killing enemies. It just doesn’t feel like Battlefront really. Which is what I wanted from this game. All in all, the Star Wars Battlefront beta is a fun experience. However, in my opinion, it doesn’t bring back memories of the old Battlefront games. It is really a FPS game of its own. I plan to pick up the full version after some YouTube reviews and once the price goes down. I personally don’t want to really pay the full price for this one. What are your thoughts on the beta? Are you looking forward to the full version and all of the changes that will come with? 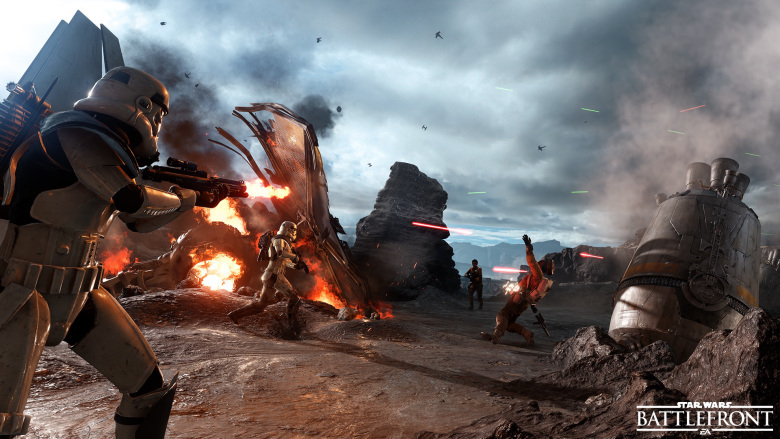 Tagged star wars battlefront beta, star wars battlefront pc specs. Bookmark the permalink. Hey , I have seen this game yesterday on youtube . Two buddies were playing spitscreen on ps4 . It looked great . Is it also Split screen on pc with offline mode ? I’m not sure… I didn’t really look. Just did a tiny bit of research though, it looks like it’s more than likely going to be apart of the PC version as well! Hey Colton. I’m another one that will not be buying at full price, I didn’t have the same loading problems as you but 100% agree with you on everything else with one added gripe. I’m not a huge pvp fan, unless they have a surprise up their sleeve, the pve content looked very lacking. Even if they added in a galactic conquest type mode, then I’d probably pay full price. Hey Dustin thanks for reaching out man! If galactic conquest, or if many of the features of the previous Battlefront games of my past, were included then I’d definitely have the game pre ordered.